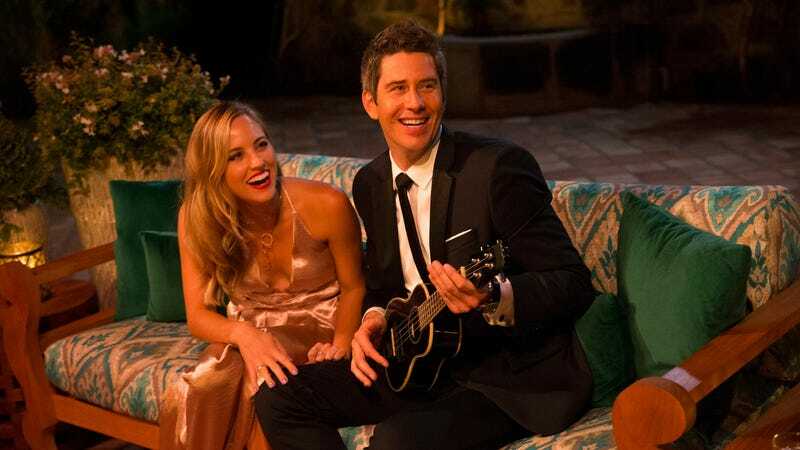 Out of necessity, last season’s Bachelor finale rejiggered the formula a bit, trading the happily-ever-afters for a heartrending event built around “the first uncut, unedited scene in reality TV history.” That scene? Bachelor Arie Luyendyk, Jr. breaking up with winner Becca Kufrin so he could get back with runner-up Lauren Burnham, a woman who spoke barely 94 sentences to Arie throughout the course of the show. The scene was excruciating, with Kufrin doing her best to maintain composure as Arie kept following her around, going in for hugs, and demanding some sort of absolution from a woman in the process of getting humiliated on national television. Really? You tried to leave and they wouldn’t let you? The problem is that nobody really cared about Luyendyk, Jr. to begin with, nor was anybody really invested in him finding love with a woman nobody learned a single iota about on the show itself. Comments indicating that the whole thing is just a little spilt milk don’t help; he proposed to Becca, then basically hid from her as he rekindled things with Lauren, then agreed to broadcast the whole thing for dubious reasons that he’s clearly justified in his own head. The good news is that he and Lauren seem genuinely in love; the bad news is that all the circumstances seem to have, understandably you could argue, made the dude paranoid as hell. After a one-on-one interview with Burnham, writer Rebecca Nelson got a series of texts from Luyendyk, Jr. accusing her of conducting a “tabloid interview” and saying he “believed it would be positive and shed light on who I am” while noting that she upset Burnham with her line of questioning (which, based on what’s presented in the article, feels like one would probably expect?). He went on to put the kibosh on further interviews, as well as a photoshoot for the feature. Woof. Meanwhile, upon meeting the guys last night, Kufrin gave the coveted first impression rose to a guy The Huffington Post discovered thinks transphobic jokes are hilarious and school shooting survivors are crisis actors. So, *sigh*, let’s do the damn thing? The Bachelor finale reveals the manipulative core of many a "nice guy"